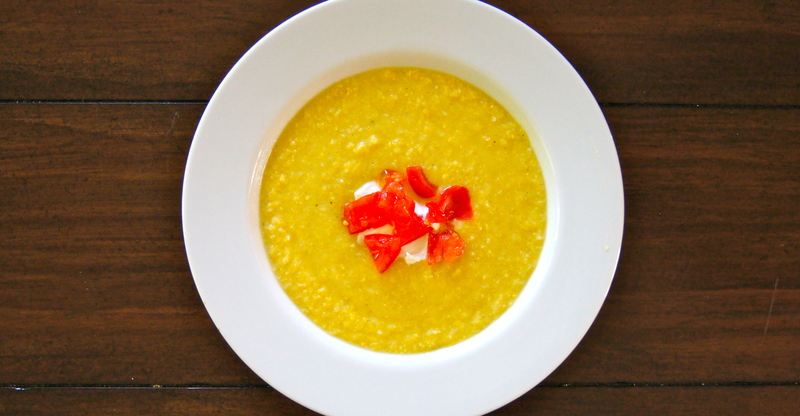 I make this soup twice a year: once in the middle of summer when the corn starts to look really sweet and healthy and once at the end so we can have one last taste of pure tremendousness. I am sad to report that the former of the two has come and gone for us; bittersweet I tell you. Here’s the deal: there are very few ingredients in this recipe and a few extra steps that are extremely simple but the result is truly exceptional. You utilize the corn in so many ways and you are left with the most sweet, savory, bright soup you will probably ever have. So take a Sunday and treat your family to the pure taste of summer; once you make it it will become a tradition for your family each year, I assure you. If you cut your kernels off the cobs on a kitchen towel or paper towel it will prevent the kernels from winding up all over your counter or the floor. 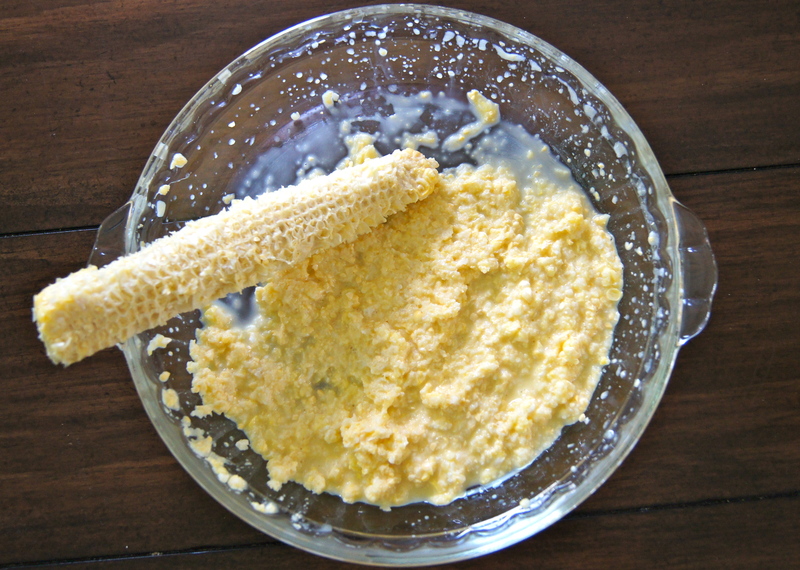 This photo makes me all hot and bothered 😉 This is the milk and pulp that is scraped from the cobs once the kernels are removed. Can you handle this? This is PURE FLAVOR people…like flavor you’ve never experienced. Magical. Cut the kernels off the ears of corn with a sharp knife. In a pie plate take each ear (once kernels are removed) and scrape the ears with the back of your knife to release all of the milk and pulp from the corn. Break cobs in half and place in a soup pot. Add the 6 cups of water and 1 teaspoon salt and bring to a boil. Cover, reduce heat to medium and simmer for 30 minutes. Throw cobs away, place the liquid corn stock in a bowl and set aside. In the same soup pot heat olive oil and butter over medium high heat and add onion, sautéing for 5 minutes. Add garlic, potatoes, 1/2 teaspoon salt, thyme leaves, crushed red pepper flakes and pepper and sauté for 1 minute. Add corn stock and bring to a boil over medium high heat. Once at a boil, cover and turn heat down to medium low. Simmer soup for 20-30 minutes or until potatoes are cooked thru. Puree soup with an emersion blender or in a food processor or blender. If using a food processor or blender return puree back to the pot, add the reserved pulp and milk from the cobs and simmer over medium heat for 10 minutes. Add salt and pepper to taste and serve with a garnishing of sour cream, diced tomatoes and crushed red pepper flakes. Serves 6.